Samsung has started mass production of what they claim is the first 2GB LPDDR3 DRAM chip for mobile applications just 10 months after mass production started on DDR2 memory. The milestone marks the first time a 2GB LPDDR3 density chip is available as an all-in-one package as it utilizes four LPDDR3 chips stacked together. The Korean giant says LPDDR3 will be a requirement moving forward as mobile devices ship with faster processors, higher resolution displays and advanced 3D graphics. Samsung highlights the fact that new LPDDR3 features a transfer rate up to 1,600 Mbps per pin (LPDDR2 maxed out at 1,066 Mbps) which equates to transmission rates up to 12.8 GB/s at the package level. This is approximately 50 percent faster than LPDDR2 parts. Samsung expects the increased throughput to be immediately evident as the new chips exceed support for full HD video playback. This will allow real-time viewing of high-quality video without having to download the content first. 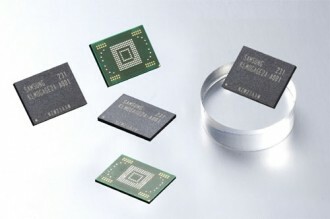 In related news, Samsung has also started mass production of 128GB eMMC for mobile devices. Besides increased storage capacity, these new chips are faster than existing products while still adhering to JEDEC eMMC v4.5 specification. These large capacity chips also use NAND with a toggle DDR 2.0 interface built using a 20nm manufacturing process. Hopefully we will begin to see smartphones ship with 2GB of RAM and up to 128GB of storage capacity in the not-too-distant future. I can’t help but wonder if a phone with 128GB of storage would render SD expansion slots obsolete. I mean, how much data does the average user carry around on their handset anyway?